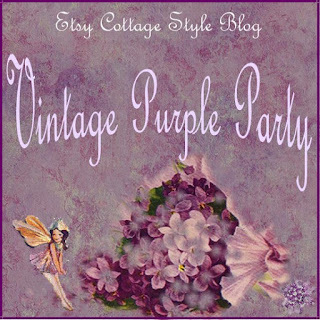 Embracing Cottage Style: The Vintage Purple party! Wowwww! How could the Purple Goat Lady miss such a wonderful party. I could show purple for days...my DH says he lives in Barney's belly. My House is Purple. Sorry I missed it, hard to be everywhere on every blog. you can still join in Barbara--the party is all week! Weeee such fun!! Love purple. Thanks for hosting this Debbi! Yay!! Another Blog PArty!! We haven't had one of these for awhile. Can't wait to stop by and see all of them! Purple - the color of royalty! One of my favorite colors - I posted a purple vintage chenille bedspread from my shop. What a fab opportunity to post about my mother's tea set! My daughter's birthday is February 13th, so I have always celebrated the month of February. I hope you enjoy seeing my vintage tablecloths in purple that I received at my bridal shower in 1963. I also handpainted a vintage silverplate tray with a violet nosegay. Enjoy. My shop on Etsy is under sandisstuff. And thanks for featuring our little silk ribbon embroidery pillows - lots of purple on them. I don't have a blog yet but I am enjoying looking at everyone elses.